What Settings can I manage in the 'Review Club features' menu option? Depending on the package that your club has selected while signing up, a list of features will appear in this section. Some features may not be relevant or needed by your club. In order to disable the same, remove the tick mark on the checkbox from that particular feature. Once this selection has been made, click on Update save your changes. How does the 'Themes & Images' section allow me to customise the club's MobileApp and Web Portal? An image for the lower half of the screen on the MobileApp. This is a static image and the club logo will appear on top of this. Selection of a theme for the MobileApp - MobiCom offers your club 3 themes from which a selection can be made. Theme 3 also provides the club with the option to upload the images for the menu. How do I set up sub-admins for my club and manage access rights for specific features? You can set up sub-admins and set access rights for each of these sub-admins within the CMS. For example, you can provide a sub-admin with Read Only access for blogs, No access to Member accounts and Read-write access to Notifications for Members.In order to set up sub-admins, click on 'Sub Admin Access Control' within the 'Settings & Access Control' section of the side bar menu. Cick on Add Sub Admin and then enter the Name, email address, Phone number of the sub admin. Classify the person as a Sub Admin or a Super Admin, member or non-member. Select the status of the sub-admin as active or inactive. Thereafter, against each feature assign access rights as 'No access', 'Read only' or 'Read Write' access for the sub admin. After this has been completed, click on Add. This can be edited at any point of time, by clicking on Edit within the 'Sub Admin Access Control' section, in the Action column. How do I add a new category of membership? To add a new category of membership, click on Membership Types within the Member Management section of the Dashboard/menu. Click on the Add Membership Type button on the top right corner. Provide details of the Name of the Membership Type, a short description of the same, and the status of this membership type i.e. either Active or Inactive. The next step is to decide on the Permissions available to this category of members. If you wish to allow a particular Membership Type to view/use the facility, tick the checkbox for Access. If you do not wish to allow this Membership Type to view/use the facility, leave the checkbox for Access blank. Once access rights have been set, click on Add to update the Membership Types in the CMS. Who can manage member details? How do I change the access rights for the same? Access rights of the sub-admins for a particular feature can be altered by going to 'Sub Admin Access Control' in the 'Settings & Access Management' section. For each feature, the super admin can choose to assign 'No access', 'Read only' or 'Read write' access to a particular sub-admin. Once the selection has been made, click on Update. Do I have to add all member details before I can submit the MobileApp and Web Portal? The MobileApp will not be approved by the App Store if this section is left blank, hence some member details must be updated. Changes and additions of members can be made after MobileApp submission without requiring an app resubmit. Can I make particular features viewable by non-members? Even within the member group, can I restrict access of some features based on the category of membership? Yes, features can be made viewable to members/non-members based on the access rights set for the same. Click on 'Display Controls' within the 'Settings & Access Control' section of the side bar menu.Here, particular features can be made viewable to members only or made viewable for non-members as well. This means that people who download the MobileApp & have not registered themselves as members through a secure authentication process can also be given access to some features, if the checkbox 'Member Only Feature' is left unticked. If the checkbox is ticked, further options are provided to the club to decide which category of membership type it is to be made viewable to. How does a member register on the MobileApp or Web Portal? A member can register on the MobileApp or Web Portal only if the club admin has uploaded their correct name & email address in the CMS. If a member tries to register on the MobileApp and the details do not match those uploaded in the CMS, the member will be unable to login. The member will then have to contact your club to ensure their details are correctly reflected in the CMS. How do I upload all member details simultaneously? Click on Choose file and select the file with updated member details from your computer and click on Submit. Your member's details would have been updated on the CMS. How do I add new member details individually? To add a member, go to the Dashboard/menu, and within the Member Management section, click on Member Database. Click on Add User on the top right corner of the page. Upload the details - Membership Number, Name, Email, Phone, select the Membership Type, Date of Birth and Gender. Thereafter, click on Add. Your member's details would have been updated on the CMS. How do I delete/edit members? To edit member details, click on Member Database within the Member Management section of the Dashboard/menu. Next to the details of the member is an option to Edit. Click on it to open member details, make the changes as required and then click on Update. You can delete members using the same process. How do I invite members to use the MobileApp or Web Portal? After uploading/adding member details in the CMS, you can invite members to download the MobileApp or logon to the Web Portal by sending them a notification. You can send them a notification by going to the Dashboard/menu and then clicking on Notifications within the Club & Member Connect section. Click on the 'Add notification' button, select whether you want to send a Push notification or an email notification or both. Type in the message and select the category of members it is to be sent to. Thereafter, click on Add to send the notification. Can I hide specific member details that I don’t want displayed in the member directory? Yes, you can select which details of members are to be displayed in the directory viewable to on the MobileApp & Web Portal. You can make this selection within the 'Member Directory Settings' of the 'Settings & Access Control' section of the Dashboard/menu. How can a member use the member directory to connect with each other? A member can view the member directory on their MobileApp & Web Portal and send a request to connect with another member. If the other member accepts the request, a communication channel is opened up between the members through which they can send messages. Does the club get involved in the communication requests between members? No, the club does not get involved in communication requests between members. It is completely upto the members to accept or reject a request to connect and also subsequently communicate. How do I add/edit content for About Us & History of the club? You can add/edit About Us & History of the club in the Club Information section of the dashboard or menu. Click on About Club/History of the club and then click on edit. You can then upload an image for the About Club/History of the club section that will be displayed to the users of the MobileApp and Web Portal. Fill in the information in the Message section and Add Paragraphs as required. Once this has been completed, click on Update to display in the MobileApp and Web Portal. How do I add/edit content for Club Rules and Dress code? You can add/edit Club Rules & Dress Code in the Club Information section of the dashboard or menu. Click on Club Rules & Dress Code and then click on edit. You can then enter a Title, description and sub-descriptions for a particular Club Rule or Dress code. Thereafter, you can add the next Club Rule or Dress Code by clicking on 'Add List Item'. Once this has been completed, click on Update to display in the MobileApp and Web Portal. How do I add/edit content for Message from the President? You can add/edit the Message from the President in the Club Information section of the dashboard or menu. You can then enter a Title and add the message description using the editor provided. This editor enables you to add pictures, tables, and a wide array or formatting options. Once this has been completed, click on Update to display in the MobileApp and Web Portal. How do I add/edit information to the Contact Us page? You can add/edit the Contact Us content in the Club Information section of the dashboard or menu. Click on Contact Us and then click on edit. You can then upload a picture of your location from Google Maps, Contact Name, address, phone number, email, Facebook page and twitter handle. Once this has been completed, click on Update to display in the MobileApp and Web Portal. How do I add/edit Membership options and enrollment criteria? You can add/edit Membership options & enrollment criteria in the Club Information section of the dashboard or menu. Click on Membership options/enrollment criteria and then click on edit. You can then upload an image to the Membership options/enrollment criteria that will be displayed to the users of the MobileApp and Web Portal. Each Membership options/enrollment criteria can be assigned a title, a description, a list and sub-lists. Once this has been completed, click on Update to display in the MobileApp and Web Portal. How does the weather feature work? The weather feature has been integrated by MobiCom and a 15-day weather forecast is displayed to the users of the MobileApp and Web Portal. There is no club admin intervention and hence there is no separate section for this within the CMS. How do I upload/delete images from the gallery? You can upload/delete images from the Gallery in the Club Information section of the dashboard or menu. Click on Gallery and then click on edit. You can then upload an image, provide a title and description for the same to be displayed to the users of the MobileApp and Web Portal. Once this has been completed, click on Update to display in the MobileApp and Web Portal. Is there a minimum or maximum number of images to be uploaded? There is no minimum number of images that need to be uploaded.A maximum of 10 images can be uploaded to the Gallery. Do I have to resubmit the MobileApp if I edit any content in this section? No, the MobileApp does not have to resubmitted if any of the contents of this section have been edited. The content updated automatically reflects on the MobileApp and Web Portal. How do I manage access rights for adding and editing content in this section? How do I make this section viewable to non-members or to only specific category of members? Access rights of the members/non-members for a particular feature can be altered by going to 'Display Controls' in the 'Settings & Access Management' section. The super admin can choose to allow the feature to be made viewable to 'members only'. If this is checkbox is selected, then the super admin can further decide which membership type it is to be made available to. If 'member only' is not selected and the checkbox is left blank then the feature will be viewable by all who download the MobileApp or access Web Portal, without having to login. Once this selection has been made, click on Update. How do I disable sub-features within this section? Can I enable them again at a later point of time if I want? If you do not wish to have any of these features displayed on the MobileApp or Web Portal, you may disable them. Click on 'Review Club Features' in the 'Settings & Access Control' section of the Dashboard/menu. From the list of features, you can then select/deselect any feature based on whether you wish to display the same on the MobileApp or Web Portal. Once the checkboxes have been reviewed, click on Update to reflect these changes. What are the details of club management that I can add? You can add details of the Management of the club, Present office bearers and committee, Past office bearers and Club Staff. For each of these sections, you can add details of the title of the person, image, name, contact details, description etc. How do I add/edit details of club management? Click on 'Club Management' of the side bar menu and then depending on whether you want to add/edit details of Management, Present Office Bearers & committee, Past office bearers or club staff click on the same. Add/edit the details, to add another person click on 'Add List Item.' To add further details about a person click on 'Add Sub-description.' The changes made will be updated on the CMS and reflected on the MobileApp and Web Portal. Access rights of the sub-admins for a particular feature can be altered by going to 'Sub Admins' in the 'Access Management' section. For each feature, the super admin can choose to assign 'No access', 'Read only' or 'Read write' access to a particular sub-admin. Once the selection has been made, click on Update. Access rights of the members/non-members for a particular feature can be altered by going to 'Display Controls' in the 'Settings & Access Management' section of the Dashboard/menu. The super admin can choose to allow the feature to be made viewable to 'members only'. If this is checkbox is selected, then the super admin can further decide which membership type it is to be made available to. If 'member only' is not selected and the checkbox is left blank then the feature will be viewable by all who download the MobileApp or access Web Portal, without having to login. Once this selection has been made, click on Update. How do I add/edit additional facilities of my club under the main facility section? To add a facility - first choose the section under which the facility is to be added. Depending on the facility you wish to add, click on either Fitness, Sports, Health Club & Spa, Salon, Other Recreational Facilities. Then click on Add facility on the top right of the screen. Fill in the Name of the facility, Description, select the appropriate category, then select whether this facility should be available for booking by members or not. Thereafter you can upload pictures and click on Add. To edit a facility, click on Edit within the Facility Listing Page. Make the changes as required and click on Update to reflect the same on the MobileApp & Web Portal. How do I add/edit pictures to club facilities? To add or edit pictures of club facilities, follow the same procedure as detailed for adding or editing a club facility. Click on Add facility and upload the pictures required. To edit pictures already uploaded, click on edit facility and choose another image file to upload. Once completed, click on Update to reflect the changes on the MobileApp or Web Portal. How does the request for booking feature work for a facility? If you have checked the 'Allow calendar booking' box, members will be able to request you to book facilities. You will then be able to either approve/reject these requests from 'Manage bookings' within the 'Facilities' section of the side bar menu. Clicking on this will take you to a page of requests for bookings raised by members for all facilities. Select a particular facility from the drop down filter provided. Thereafter you will be able to view all the booking requests, click on edit to either approve or reject a request. Additionally, you can also provide your comments to the member or view comments raised by a member on a particular booking. To send the status to the member/user of the MobileApp or Web Portal, click on Update. Does the member get notified if a request for booking is accepted/rejected? The member can check the status of their booking request by opening the section where a request for booking was raised in the MobileApp or Web Portal. If you wish to inform the member about the status, you can also send a email or push notification from the CMS. Click on 'Notification to Members' within the 'Club & Member Connect' section of the side bar menu, update the details, select the member you wish to send the notification to and then click on add. For sports facilities, how does the Live Score Update feature work? The Live Score Update for Sports facilities provided the club admin with 2 choices. The club admin can either provide a URL to an existing scoring software, which will display the score within the MobileApp/Web Portal or the club admin can choose to add the scores using the text editor provided. By retaining the history of previous scores, new scores can be added in within this editor. The score updates will be updated on the CMS and reflected on the MobileApp & Web Portal. How do I disable sub-features/facilities within this section? Can I enable them again at a later point of time if I want? Can I add multiple restaurants to be displayed within this section on the MobileApp and Web Portal? Yes, you can add the various F&B facilities that your club has by clicking on Food & Beverage and then clicking on Restaurants & Bars on the side bar menu. Click on Add facility on the top right of the screen, update the Name of the facility, description, category and images. Once completed, click on Add. How do I add a new item to the menu? To add a new menu item, click on 'F&B Facilities' within the 'Food & Beverage' menu option of the side bar menu. You can then click on 'Add Menu Card' on the top right of the page. In the screen that opens, you can select the Category or Type of item it is - Starter, Main Course, Beverage or Dessert. Add the Name of the item, a description, the price and an image. You can also select a particular attribute for the item. Once the details have been filled in, click on Add. This will be updated in the CMS and reflected on the MobileApp and Web Portal. Can I upload the menu via a picture/scan? In order for the user of the MobileApp/Web Portal to have a better experience, we have provided for every menu item to be added individually. How do I edit an item from the menu? To edit a menu item, click on 'Restaurants & Bars' within the 'Food & Beverage' menu option of the side bar menu. You can then click on 'Manage Menu' and then click on 'Edit' against the menu item that is to be changed. In the screen that opens, you can make the changes required and click on Update. This will be updated in the CMS and reflected on the MobileApp and Web Portal. How can members place an order for any of the items on the menu? If your club has opted for the Enterprise package and your club has an existing Kitchen ordering software, MobiCom can integrate the CMS to this and hence enable easy ordering for your members. 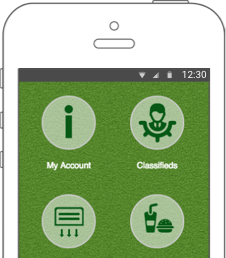 The members can then place orders for any menu item from the MobileApp or Web Portal. I have opted for the enterprise package; how can I integrate my existing ordering tool/system with the MobiCom License software? Please get in touch with us at support@mobicom.com for further details. Are there any additional costs involved for this integration? There may be some additional costs involved for this integration based on time and effort. Get in touch with us at support@mobicom.com for further details. Can members reserve a table at the restaurant? No, currently we do not support this feature. Our software will constantly evolve to add many such features in the coming months. How do I disable this section? Can I enable it again at a later point of time if I want? How can I add rooms? You can add rooms by clicking on 'Room listing' in the 'Rooms' section of the side bar menu. Click on Add on the right top of the screen. Fill out the Title/Name of the Room, a description of the room, select the category as Rooms and then select the status as Visible to allow member to view the same on the MobileApp & Web Portal. If you wish to allow members to send you requests to book the room facility, select the checkbox 'Allow calendar booking'. Add images of the room and then click on Add. This will now be reflected on the MobileApp & Web Portal. How can I edit description, details & pictures of a room? You can edit the details and pictures of a room by clicking on 'Room listing' in the 'Rooms' section of the side bar menu. Click on edit next to the name of the Room that you wish to make changes to. Make changes to the Title/Name of the Room, description, ability for members to request for booking of that room & images. This will now be reflected on the MobileApp & Web Portal. How can I delete rooms? You can delete a particular room by clicking on 'Room listing' in the 'Rooms' section of the side bar menu. Click on edit next to the name of the Room that you wish to delete. In the option provided for Status, select 'Hidden' instead of 'Visible'. This will hide the room from view of members on the MobileApp & Web Portal. What are the two options that are available for room booking, if I have opted for the Enterprise package? if your club has opted for the Enterprise Package, the 2 options to select from for Room Booking are - 1. Request for booking through a calendar - Once a request for booking has been raised by a member on the MobileApp/Web Portal, the club can either approve or reject this request from the Content Management System. 2. Online Room Booking - If your club has an existing Room booking software, you can then integrate this with MobiCom's licensed software to enable your members to have a seamless room booking experience. This feature is subject to review and third party system integration process. To gain further information, write to us at support@mobicom.com. If I have opted for ‘Request for booking through a calendar’, how do I manage member booking requests? If you have checked the 'Allow calendar booking' box, members will be able to request you to book rooms. You will then be able to either approve/reject these requests from 'Manage bookings' within the 'Rooms' section of the side bar menu. Clicking on this will take you to a page of requests for bookings raised by members for all facilities. Select rooms from the facility drop down filter provided. Thereafter you will be able to view all the booking requests, click on edit to either approve or reject a request. Additionally you can also provide your comments to the member or view comments raised by a member on a particular booking. To send the status to the member/user of the MobileApp or Web Portal, click on Update. Will the member get notified if I approve/reject a booking request? Yes, a member will get notified by email and push notification on the MobileApp when you approve or reject the booking requested. If I want to opt for the ‘Online room booking’, how can I integrate my existing booking tool/system with the MobiCom Licensed software? Will the MobiCom Software provide an inventory management system for the rooms? The MobiCom Software does not manage your club's inventory of facilities. MobiCom provides a platform for your club to display available facilities and allows members to request booking for the same. On the other hand, if you have an existing room inventory management software, MobiCom can also integrate the CMS to the software to enable members to book rooms directly from the MobileApp & Web Portal without having the need for an admin to approve or reject their booking. Access rights of the members/non-members for a particular feature can be altered by going to 'Display Controls' in the 'Settings & Access Management' section. The super admin can choose to allow the feature to be made viewable to 'members only'. If this is checkbox is selected then the super admin can further decide which membership type it is to be made available to. If 'member only' is not selected and the checkbox is left blank then the feature will be viewable by all who download the MobileApp or access Web Portal, without having to login. Once this selection has been made, click on Update. How can I add Banquet/Conference Rooms? You can add Banquet/Conference rooms by clicking on 'Room listing' in the 'Banquet/Conference Rooms' section of the side bar menu. Click on Add on the right top of the screen. Fill out the Title/Name of the Room, a description of the room, select the category as Rooms and then select the status as Visible to allow member to view the same on the MobileApp & Web Portal. If you wish to allow members to send you requests to book the Banquet/Conference room facility, select the checkbox 'Allow calendar booking'. Add images of the Banquet/Conference room and then click on Add. This will now be reflected on the MobileApp & Web Portal. You can edit the details and pictures of a Banquet/Conference room by clicking on 'Room listing' in the 'Banquet/Conference Rooms' section of the side bar menu. Click on edit next to the name of the Room that you wish to make changes to. Make changes to the Title/Name of the Room, description, ability for members to request for booking of that banquet/conference room & images. This will now be reflected on the MobileApp & Web Portal. You can delete a particular room by clicking on 'Room listing' in the 'Banquet/Conference Rooms' section of the side bar menu. Click on edit next to the name of the Room that you wish to delete. In the option provided for Status, select 'Hidden' instead of 'Visible'. This will hide the room from view of members on the MobileApp & Web Portal. How does the request for booking feature work for banquet and conference rooms? If you have checked the 'Allow calendar booking' box, members will be able to request you to book banquet/conference rooms. You will then be able to either approve/reject these requests from 'Manage bookings' within the 'Banquet/Conference Rooms' section of the side bar menu. Clicking on this will take you to a page of requests for bookings raised by members for all facilities. Select banquet/conference rooms from the facility drop down filter provided. Thereafter you will be able to view all the booking requests, click on edit to either approve or reject a request. Additionally, you can also provide your comments to the member or view comments raised by a member on a particular booking. To send the status to the member/user of the MobileApp or Web Portal, click on Update. What are the various features available in this section? News - This section is intended for the club to keep members informed about news within the club. How can I add a forum? To add a Forum, go to the Dashboard/side bar menu, and within the Club & Member Connect section, click on Forums. Click on Add Forum on the top right corner of the page. Upload the details - Title and Description as per your specifications. Thereafter, click on Add. The details of your forum would have been updated on the CMS and reflected on the MobileApp and Web Portal. Is a member enabled to add a forum? Yes, a member is enabled to add a forum through the MobileApp and Web Portal. How can I add a topic to the forum? To add Topic to the forum, click on Edit l View Topics in the Action column which relates to a particular forum. A new page of the chosen forum opens. Click on Add Topic on the top right corner of the page. Upload the details - Title and Description as per your specifications. Thereafter, click on Add. The details of your forum would have been updated on the CMS and reflected on the MobileApp and Web Portal. Is the member enabled to add a topic to the forum? Yes, a member is enabled to add a topic to the forum through the MobileApp and Web Portal. How can I moderate the comments that are posted on a forum? The comments of a forum cannot be moderated. An admin can choose to publish or reject a forum or topic that has been created by a user. Can I edit a forum after it has been added? Yes, the club admin can edit a forum after it has been created. While in the Forums page, click on Edit l View Topics in the Action column which corresponds to a particular forum. Edit the details - Title, Description and Status to either Published or Hidden and click Update on the bottom left corner of the page. The details of your forum would have been updated on the CMS and reflected on the MobileApp and Web Portal. Can a member edit a forum that has been created? A member is enabled to create and view forums but is not given permission to edit forums or topics. Can I keep this forum section open for viewing for non-members or a specific category of members? Can I also restrict the viewing of a particular forum to a specific category of members? Yes, when adding a forum or a topic to a forum, you can select the category of membership it should be viewable by. Hence, you can not only restrict the forum menu item itself, but also a forum in particular. When adding or editing a forum, select the type of members who will have access to the same. What are the features supported by the blogs section? The blog section enables you as the club admin to create and post a blog. You can also moderate comments that are received on blog posts. How can I add/edit a blog? To add a Blog, go to the Dashboard/side bar menu, and within the Club & Member Connect section, click on Blogs. Click on Add Blog on the top right corner of the page. Upload the details - Title, Description and Status to either Visible or Hidden as per your specifications. Thereafter, click on Add. The details of your blog would have been updated on the CMS and reflected on the MobileApp and Web Portal.To edit a blog, click on Edit in the Action column which corresponds to a particular blog. Edit the details - Title, Description and Status to either Visible or Hidden and click Update on the bottom left corner of the page. The details of your blog would have been updated on the CMS and reflected on the MobileApp and Web Portal. Is a member enabled to add/edit a bog? No a member cannot add/edit a blog. Only the club admin can add or edit a blog. How can I moderate comments that are posted for a blog? Under the Club & Member Connect section, click on Moderate Comments and then click on either Approve/Disapprove corresponding to each comment posted on the blog. How can I auto approve comments for a blog? In order to ensure that your club is always aware of the information that is being posted on the platform, you cannot auto approve blog comments. These are to be moderated by the sub admin assigned to manage blogs. Can I keep this section open for viewing for non-members or a specific category of members? What can this section be used for? The Media section is used to display the club's media posts with reference to any press meet, publications and broadcasts. It can be used to publish various URLs with regards to the recent club news, leadership bios, downloadable press kits etc. How do I add a new media post? To add a Media post, go to the Dashboard/side bar menu, and within the Club & Member Connect section, click on Media. Click on Add Media on the top right corner of the page. Upload the details - Title, Description, Website URL, Status as either Visible or Hidden and even add an Image by clicking the Browse button. Thereafter, click on Add. The details of your Media post would have been updated on the CMS and reflected on the MobileApp and Web Portal. How do I edit a media post? To edit a Media post, click on Edit in the Action column which corresponds to a particular post. Edit the details - Title, Description, Website URL, Status to either Visible or Hidden and the Image too. Thereafter, click Update on the bottom left corner of the page. The details of your Media post would have been updated on the CMS and reflected on the MobileApp and Web Portal. How do I delete a media post? You can delete a particular media post by clicking on 'Media' in the 'Club & Member Connect' section of the side bar menu. Click on edit next to the particular media post you wish to delete. In the option provided for Status, select 'Hidden' instead of 'Visible'. This will hide the post from view of members on the MobileApp & Web Portal. What can this section be used for and how is it different from the Media section? The News section is intended to enable communication with the club members regarding internal club news and keep them updated with the current happenings in the club. It can be in the form of a newsletters or newsfeed. How do I add a news item? To add a news item, go to the Dashboard/side bar menu, and within the Club & Member Connect section, click on News. Click on Add News on the top right corner of the page. Upload the details - Title, Description and Status as either Visible or Hidden . Thereafter, click on Add. The details of your News post would have been updated on the CMS and reflected on the MobileApp and Web Portal. How do I edit a news item? To edit a News item, click on Edit in the Action column which corresponds to a particular post. Edit the details - Title, Description and Status to either Visible or Hidden. Thereafter, click Update on the bottom left corner of the page. The details of your News item would have been updated on the CMS and reflected on the MobileApp and Web Portal. You can delete a particular news feed by clicking on 'News' in the 'Club & Member Connect' section of the side bar menu. Click on edit next to the particular news feed you wish to delete. In the option provided for Status, select 'Hidden' instead of 'Visible'. This will hide the post from view of members on the MobileApp & Web Portal. How do I send email notifications to members? To send email notifications to members, go to the side bar menu, and within the Club & Member Connect section, click on Notifications to Members. Click on Add Notification on the top right corner of the page. Upload the details - click on the box below the Channel title and select Email, enter Email Subject, Message for Email and then select your choice of recipients from among All, Type or Names . Thereafter, click on Add. Your email notifications would then be sent to all recipients selected. Can I send notifications only to a particular category of members or only to a particular member that I select? By selecting recipients from among All, Type or Names in the To section on the bottom left corner of the Add Notifications page, the notifications can be sent to a selected category of persons. How can I check the status of the notification I have sent? To check the status of the notification that has been sent, look under the Status title on the Notifications sub-menu option. The status will be updated as Closed if the message has been sent. What does the status ‘open’ for a notification mean? The 'Open' status of the notification means that it has not been sent. It takes a couple of minutes for the notification to be sent to all persons selected. What does the status ‘closed’ for a notification mean? The 'Closed' status of the notification means that it has been sent. Can I send an email notification and a push notification simultaneously? Yes, an email notification and a push notification can be sent simultaneously by selecting All under the title Channel and then just entering the details in all the tabs including the Message for Push Notifications tab which appears below the Message for Email tab in the Add Notification page. Thereafter, click Add and the push notifications & email notification will be sent to the selected category of persons. How do I send push notifications to members? To send push notifications to members, go to the side bar menu, and within the Club & Member Connect section, click on Notifications to Members. Click on Add Notification on the top right corner of the page. Upload the details - click on the box below the Channel title and select Push, enter a 'Message for push notifications' in the box provided for the same and then select your choice of recipients from among All, Type or Names . Thereafter, click on Add. Your push notifications would then be sent to all recipients selected. Can I send a push notification and an email notification simultaneously? Will the notification history be retained in the member’s app for them to view at a later point of time? Yes, the notification history will be retained in a member's MobileApp/Web Portal for viewing at a later point of time. I have opted for the enterprise package; how can I integrate the existing SMS gateway to the MobiCom Licensed Software? What are the benefits of this integration? The benefit of the integration of your existing SMS gateway provider with MobiCom's licensed software is that all notifications to members can be sent from the same system at a click of a button. Hence, email, push and SMS notifications can all be sent simultaneously. Once integrated, how do I send SMS notifications to members? To send SMS notifications to members, go to the side bar menu, and within the Club & Member Connect section, click on Notifications to Members. Click on Add Notification on the top right corner of the page. Upload the details - click on the box below the Channel title and select SMS, enter a message in the box provided for the same and then select your choice of recipients from among All, Type or Names. Thereafter, click on Add. Your SMS notifications would then be sent to all recipients selected. By selecting recipients from among All, Type or Names in the To section on the bottom left corner of the Add Notifications page, the push notifications can be sent to the selected category of members. To check the status of the push notification that has been sent, look under the Status title. The status will be updated as Closed if the message has been sent. The 'Open' status of the notification means that it has not been sent. Can I send an SMS, push notification and email notification simultaneously? Yes, an email, SMS and push notification can be sent simultaneously by selecting All under the title Channel and then entering the details in all the tabs. Thereafter, click Add and the push notification, email & SMS notification will be sent to the selected category of persons. How can I add a new event? To add an event, go to the Dashboard/side bar menu, and within the Events section, click on Events Listing. Click on Add Event on the top right corner of the page. Upload the details - Event Title, Event Description, Event Location, etc. Thereafter, click on Add. The details of your event would have been updated on the CMS and reflected on the MobileApp and Web Portal. What are the event details that I can upload? Is Bookable : If the club wishes to accept request for booking of tickets for this event, then the checkbox can be selected. This will result in the club admin to be able to manage booking requests on the CMS. Upload Photos for the Event : A maximum of three images can be uploaded for the event by clicking the Browse button and then selecting the file of your choice. Where can pictures of past events be uploaded? To upload pictures of a past event, go to the Dashboard/side bar menu, and within the Events section, click on Events Listing. Click on the Edit link for the particular event under the Action column to the extreme right of the page. The selected event page opens up and in the Upload Photos for the Event section, click on the browse button which allows you to individually add a maximum of three images. Thereafter, click on Update on the bottom left hand corner of the page. The details of your event would have been updated on the CMS and reflected on the MobileApp and Web Portal. How can a member request to book tickets for an event? Using the MobileApp and Web Portal, the member can select the event and request for booking the tickets. If the club admin approves the same, the member's tickets will be booked. How can I accept/reject a member’s request for booking of tickets for an event? If you have checked the 'Allow calendar booking' box, members will be able to request you to book banquet/conference rooms. You will then be able to either approve/reject these requests from 'Manage bookings' within the 'Event bookings' section of the side bar menu. Clicking on this will take you to a page of requests for bookings raised by members for events. You will be able to view all the booking requests, click on edit to either approve or reject a request. Additionally you can also provide your comments to the member or view comments raised by a member on a particular booking. To send the status to the member/user of the MobileApp or Web Portal, click on Update. How can I manage all member accounts using this section? You can upload all member account details into the CMS and manage member accounts. Members can pay their bills, event bookings will be debited, and member accounts will be kept up to date. How can I upload all member account details using an excel file? Click on 'Upload Member Bill' within the 'Member Accounts' section of the menu. Once the template provided has been updated, click on Choose file and upload the same. Click on Submit. These details will now be displayed to your members on the MobileApp and Web Portal. How can I upload specific bills pertaining to members if my club has not opted for the ‘Live accounts’ feature? To upload a specific bill pertaining to a member, click on Upload Member Bills within the 'Member Accounts' section of the side bar menu. Click on choose file to select the bill from your computer and then click on Submit. The bill will then be updated in the CMS and reflected on the MobileApp and Web Portal. How can I view and respond to queries that members have raised on specific charges? Members are enabled to raise queries on specific charges to seek clarification from the club admin. In order to view the queries raised and respond to the same, click on Member Queries within the 'Member Accounts' section of the side bar menu. If I have the payment gateway integrated into the MobileApp and Web Portal, what are the various payment options available to a member? The member can pay the amount due against his member account from the MobileApp or the Web Portal. This can be done through the payment gateway that is integrated, using the payment methods selected by you. How do I view and track payments made by members through the payment gateway? You can view and track payments made by members on the MobileApp and Web Portal through the Dashboard provided by the Payment Gateway provider. In order to view the same, click on Payment Gateway Dashboard in the Quick Links. I have opted for the enterprise package; how can I integrate my existing accounting software with the MobiCom Licensed software? How can I use this section to display sponsor information? You can display your sponsors information in the club in a separate section dedicated to Sponsors. Depending on the package opted for, the number of sponsors and the sponsorship information that can be displayed on your MobileApp and Web Portal will vary. The club can use this section as a monetization opportunity for itself. If I have opted for the Basic package; what sponsor information can I display? If you have opted for the Basic Package you can display upto 6 sponsors and also provide a URL link for further sponsor details. A member can click on this link in the MobileApp or Web Portal for further information. If I have opted for the Advanced package, what sponsor information can I display? If you have opted for the Advanced Package you can display upto 12 sponsors, provide a URL link for further sponsor details as well as be given a page of real estate to advertise itself. A member can click on a sponsor in the listing page of the MobileApp or Web Portal and then view the advertisement and the sponsor's URL. If I have opted for the Enterprise package, what sponsor information can I display? If you have opted for the Advanced Package you can display upto 18 sponsors, provide a URL link for further sponsor details as well as be given a page of real estate to advertise itself. A member can click on a sponsor in the listing page of the MobileApp or Web Portal and then view the advertisement and the sponsor's URL. How do I add a classified? Only a member can add a classified. The admin is given the authority to either approve or reject the publication of a classified on the MobileApp or Web Portal. How do I approve/reject a classified submitted by a member? In order to approve/reject a classified submitted by a member, click on Classifieds within the 'Sponsors & classifieds' section of the side bar menu. Thereafter, click on either approve or reject in the Action column of the page. Once accepted, this classified will be viewable by members who logon to the MobileApp or Web Portal. Will the member get notified if I approve/reject a classified submitted? Yes, a member will get notified by email and push notification on the MobileApp when you approve or reject the classified submitted. How can the club add a poll? You can add a poll by clicking on Online Polling within the 'Online Polling & Survey' of the side bar menu. Click on Add Poll on the top right corner of the page. The details such as title, description, image can be filled in. Thereafter, you can select whether the Poll question has a single choice or has multiple choice. Then select the date until which the poll will be valid and select the status of the poll i.e. whether it should be visible on the MobileApp and Web Portal or hidden. Select the number of options that you want to provide for the answer and then click on Next to fill in the answer options. Once completed, click on Add to publish the poll on the MobileApp and Web Portal. Can an end duration be added to the poll? Yes, an end time can be added to the poll by setting the Validity date while creating the poll. This can also be edited at a later point of time. How can the results of the poll be published? The club admin can view the results of a poll by clicking on results in the 'Online Polling' page under the 'Online Polling and Survey' side bar menu option. Once the poll has been completed, the club admin can publish the poll results within the news section of the MobileApp/Web Portal by going to the 'Club and Member Connect' section and adding a new news item. How can the club create a survey for members? You can add a survey by clicking on Online Survey within the 'Online Polling & Survey' of the side bar menu. Click on Add Survey on the top right corner of the page. The details such as title, description, image can be filled in. Then select the date until which the survey will be valid and select the status of the survey i.e. whether it should be visible on the MobileApp and Web Portal or hidden. Thereafter, you can select whether the survey has single, multiple choice questions or is a requires a descriptive answer. Click on Add Question and provide question details and details of the options. Once completed, click on Add to publish the survey on the MobileApp and Web Portal. Can a particular survey have more than one question? Is there a limit to the number of questions in a survey? Yes, a survey can have more than one question. There is no limit to the number of questions that can be added to a particular survey. How can I notify members about the creation of a new survey that requires their input? You can inform members about a new poll or survey by sending them a notification regarding the same. Click on Notification to Members within the 'Club & Member Connect' section of the side bar menu. This can be used to send an email or push notification to members regarding adding of the survey. How can the results of the survey be published? The club admin can view the results of a survey by clicking on results in the 'Online Survey' page under the 'Online Polling and Survey' side bar menu option. Once the survey has been completed, the club admin can publish the survey results within the news section of the MobileApp/Web Portal by going to the 'Club and Member Connect' section and adding a new news item. Can a poll or survey be created only for a particular category of members? No, a poll or survey is open to all category of members. How do I add/edit a description of the golf facilities that our club has? If your club has opted for the additional golf package, then a menu option called Golf will be present in your CMS. In order to set up the golf course, click on 'Set Up & Tee Time Booking'. You can then fill in details regarding the number of holes, number of tee boxes, rules, images and description. How do I publish the handicap list? If your club has an existing handicap software, the handicap list can be uploaded and published on the MobileApp and Web Portal. Click on Handicap within the 'Golf' section of the side bar menu. Click on Upload Handicap on the top right corner of the page. Choose the file that is to be uploaded from your computer and click on Upload. The changes will be made on the CMS and reflected on the MobileApp and Web Portal. How do I enable tee time booking over the MobileApp and Web Portal? Tee time booking can be enabled over the MobileApp and Web Portal if your club has an existing tee time booking software in the backend. MobiCom's Licensed Software will be integrated to your existing software to provide members with a seamless experience. If you have a software, please get in touch with us at support@mobicom.com for further details. How can I add/edit pictures of golf facilities? How do I add a new golf tournament on the MobileApp and Web Portal? If your club has opted for the additional golf package, then a menu option called Golf will be present in your CMS. In order to add a new golf tournament, click on 'Tournament listing'. Then click on Add Tournament on the top right corner of your page. You can then fill in details regarding the name of the tournament, description, start date, end date & number of events within the tournament. Once the number of events has been selected, click on next to enter details of the event such as name, number of slots and team size. Click on Next to enter details of start and end time and number of teams per type of event. Once completed, click on Next to update the details of the Tournament on the MobileApp and Web Portal. How do members register for tournaments on the MobileApp and Web Portal? Member can raise a request to register themselves for a tournament on the MobileApp or Web Portal. The admin can then manage registrations that have been requested. How do I manage tournament registrations on the CMS? In order to manage registrations for Golf tournaments, click on Tournament Listing on the side bar menu. Click on 'Registrations' against the tournament you wish to manage. You can then either Approve/Reject the registration. Of you approve the same, you can then allocate a hole number and tee slot to the person. How does the ‘Score Card’ feature work? This feature is to enable your members to play with their buddies on the course. Each player can choose who they will mark/update scores for on the MobileApp. Hence each player in a group will get marked by their buddy and they can also update scores for themselves. If there is a discrepancy in the scores updated between the marker and the player, the admin can update the scores in the 'Score Card & Leaderboard' section of the CMS. Click on 'Show Scores' and then click on update scores against the player's name for whom you want to update the score. How does the ‘Leaderboard’ feature work? The leaderboard shows the total score as well as the Rank of the player. This will also be displayed on the MobileApp and Web Portal for the players to view. The score cards are collated and the Leaderboard displays the same.